One of the benefits of a part-time gig at a wine store, is whether I’m working that night or not, I get to participate in a variety of staff education nights we have in our tasting room. Last night was no exception. This doesn’t happen often, but last night’s lineup featured a reputable Canadian winery from Oliver, BC in the Okaganan Valley. This little microclimate, (which includes several on the Black Sage Road), produces some outstanding wines. The Black Hills Vineyard and Winery is no exception. This area is receiving an increasing number of guests and often you will see “sold out” signs on the doors of tasting rooms. That’s pretty cool…. Unlike other countries, we pay a LOT for wine from our own freaking backyard. Here’s the irony: I live in this beautiful, vast, job-friendly, economy friendly country, yet I pay MORE to fly within my own country that I would to fly across the pond. Cell phone plans are more costly here than anywhere else in the entire world, AND…..I pay more for wine from my own country than any other. 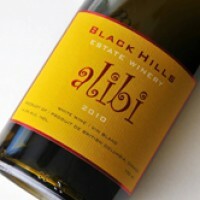 This brings me to the Alibi from Black Hills Winery. A crisp, refreshing white Bordeaux blend that filled my mouth with beautiful baked pears, hints of cinnamon, mouth-watering acidity, and slight unctuousness. The 75% Sauvignon Blanc aged in stainless steel provided the freshness, while the 25% barrel-aged Semillon provided the structure and mouth feel. I loved this wine from the nose through to the palate and the finish. And I know that over half the crowd enjoyed it also. The drawback? This wine is on the shelf for $31. Not a particularly easy-going price to just use this wine to sit on the patio and enjoy the sun with. Yeah, it’s a Bordeaux blend, but still….this wine requires planning: A plan to have some good people over to enjoy a decent meal with; to be able to sit around afterwards and pair it (again) with a great dessert. It’s not necessarily ageable (like a Bordeaux), and I could get TWO patio sipper wines for this one price from other countries. 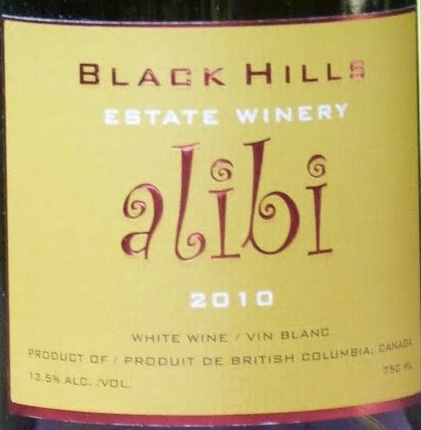 This entry was posted in wine and tagged Alibi, Bordeaux, Canada, Okanagan, price, Sauvignon Blanc, Semillon, tasting, value. Bookmark the permalink.